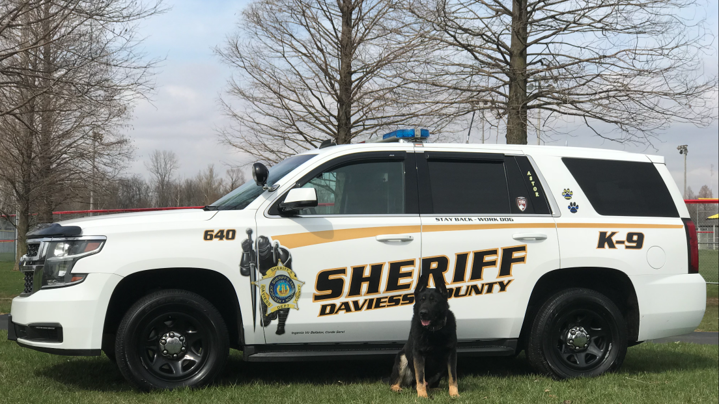 The Daviess County Sheriff’s Office K9 Unit consists of Deputy Russ Day and his K9 partner “Astor”. Astor is a 3 year-old German Shepherd imported from Slovakia and obtained from Xtreme Concepts in Anniston Alabama. Astor is a dual-purpose Sheriff’s K9 trained and certified in narcotic detection and patrol. His patrol certification includes obedience on and off lead, tracking suspects, locating evidence, building searches for suspects, suspect apprehension, and handler protection. Deputy Day and Astor are certified annually as a “Patrol Dog Team” through the American Police Canine Association (www.theapca.com). In 2016, we lost K9 Jordan to retirement for medical reasons. K9s4Cops, the non-profit organization responsible for our agency receiving Jordan, agreed to provide a replacement for K9 Jordan. Kristi Schiller, along with the Board of K9s4Cops, granted another K9 to our department. Those interested in learning more about “K9s4Cops” should visit their website at “k9s4cops.org”. In his first year Astor has been on duty, he has been instrumental in taking methamphetamine, marijuana, prescription drugs, and guns off our streets. The numbers represent 10 months of service, as our K-9 deputy, Russ Day, was out on injury leave for the months of November and December. Our K-9 Unit has not only proven to be an invaluable asset to our office, but to numerous law enforcement offices in the surrounding area. Many of these law enforcement agencies do not have access to a K-9 team of their own. Our assistance has consisted of searching for illegal drugs, tracking criminals, tracking lost children, and searching buildings for felons. By assisting other agencies, we are able to show how a well-trained K-9 unit is a valuable resource carrying a minimum cost to the office. The K-9’s acute sense of smell is probably one of their best assets. A K9 is simply a tool to locate illegal drugs, evidence, or criminals. Statistically, during a building search a K-9 can perform the search 70% quicker than a four-man special response team, with a 93% success rate. By using a K-9 in this situation, the most important factor is officer safety, as officers do not have to enter the building searching for a possibly armed suspect. Secondary K9 teams help cut down on man-hours of officers at a crime scene. The example also holds true with narcotics searches and tracking criminals. As stated earlier, a well-trained K9 team gives our Office the “best bang for the buck”. Aside from the K-9 teams’ normal duties, the unit performs numerous demonstrations for civic, private, and school groups along with Cub Scout, Boy Scout, and Girl Scout troops. These demonstrations help to educate the general public of the great capabilities of this well-trained team. The team has gone to various businesses and factories and conducted drug detection sniffs. They have also performed drug sniffs at Rosie’s Houses Drug Rehabilitation Programs, The Dismiss Houses of Owensboro, Women’s Prison property, and others. Deputy Day’s K9 is extremely social and has even been invited to neighborhood festivities in and around Owensboro. Our K9 Team continues to strive to be one of the best in the state. They train a minimum of sixteen (16) hours per month. This training is done jointly with K9 units from the Owensboro Police Department, the Daviess County Detention Center, the Hopkins County Sheriff’s office, the Madisonville Police Department, the McLean County Sheriff’s Office, the Russellville Police Department, the Spencer County (IN) Sheriff’s Office, the Dale (IN) Police Department, and the Tell City (IN) Police Department. The training group is named “Vigilant K9”. 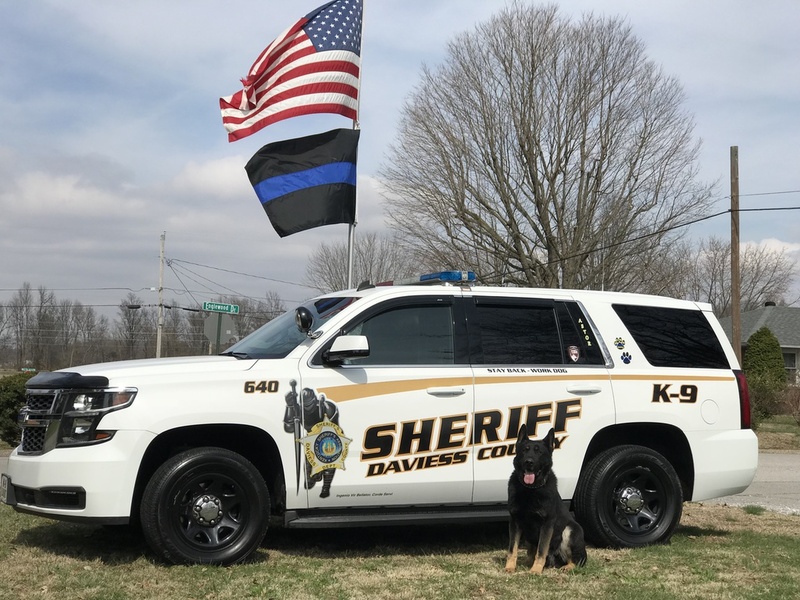 Our K9 Team continues to build on the professionalism the Daviess County Sheriff’s Office is so well known for.